Show off your true colors and preferences. Whether it’s based on a favorite team, the type of filler metal, or your welding machine – with Rod Guard colored canisters, you can have it YOUR way. Our heavy-duty cable connectors are precision machined from heavy, specially shaped brass extrusion, and are insulated by a completely non-metal, heat/cold resistant cover. They’re also available in just about any color you can dream up. Anyone stepping up to higher amperage needs a water-cooled system to keep productivity high and tools in tip top shape. Excessive heat quickly degrades your torch and consumables. Essential components of a water-cooled welding rig include: water-cooler, compact torches, connectors, & vane-style water pumps. Questions??? Give us a shout – We’re here to help! Is your Air-Cooled TIG torch too hot to handle? It may be time to think about upgrading to a water-cooled system. You’ll be able to use water-cooled torches that run much cooler and allow you to access higher amperages. Think of all the welding possibilities! 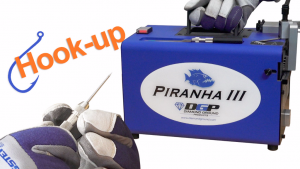 Invest in the new & improved Piranha III-A and we’ll hook you up with $75 worth of tungsten for FREE. The new PG3-A is lighter, has dust containment, a universal collet arm, pin vise, and illuminated on-off switch. This Grinder is voracious and spits out a precision grind every time. Fear No Tungsten!!! We enjoy celebrating the people and tools that make our welding community great. Nick (@mishler_made_fab) knows the benefits of a water-cooled rig first hand – it allows him to work with a smaller, cooler torch without having to stop & wait til everything cools down. Plus, his tools and consumables last longer. What’s your secret to productivity in the shop? Join the conversation, and share your work with us @arc_zone. Sometimes, it only takes a few arcs and sparks to make your day… and help you “Sail!” This week, we’re featuring a collage of pipe welding still shots set to music (-Thanks AWOLNATION, for the tunes). Enjoy and As Always, Good Welding! This entry was posted in Arc-Zone.com, The Metal Mashup, TIG Welding, Uncategorized, Welding Accessories, Welding Industry News, Welding Supplies on July 25, 2016 by Julio.